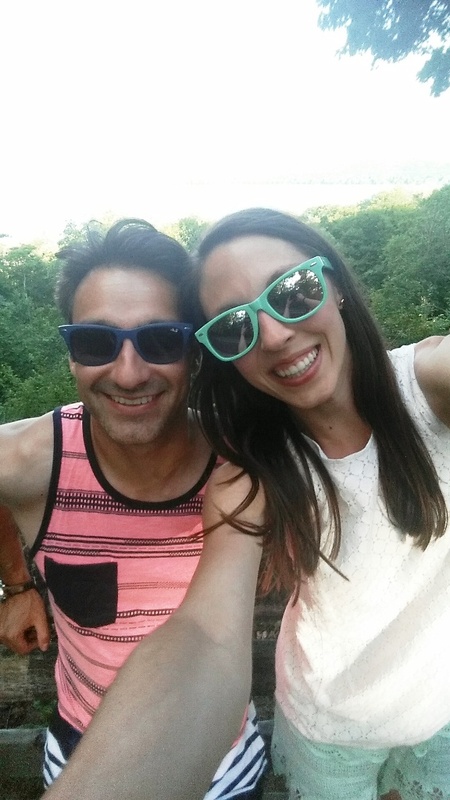 You can read about the first part of our trip to Traverse City here. Traverse City is one of the most beautiful places that I have ever seen and I highly recommend visiting there! I can’t wait to return. 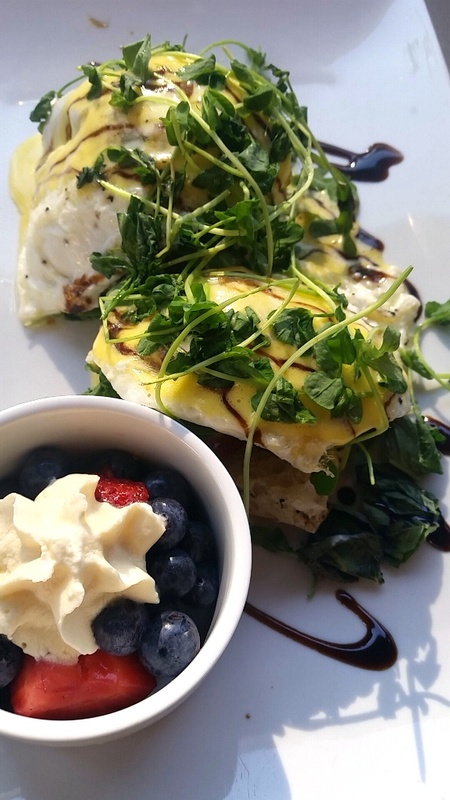 On our third day in Traverse City, we had our favorite meal of the trip: breakfast at Reflect Bistro which was located right in our hotel Cambria Hotel and Suites. It was incredible and we are still talking about it. 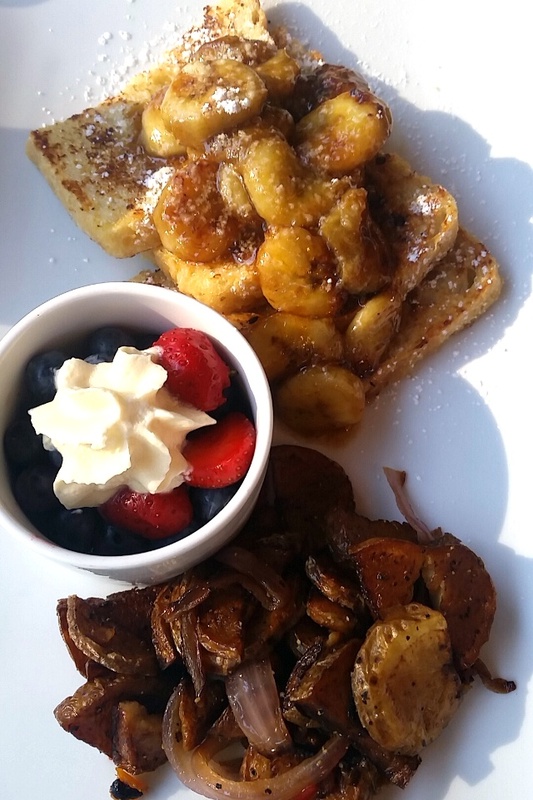 Adalyn’s meal was amazing: bananas foster French toast which was perfectly crispy yet chewy and was made with sourdough bread. I ordered the Italian benedict and Troy ordered the lobster benedict. Both were truly amazing and all of three of these items helped to make this meal the favorite on our trip. All three meals came with fresh blueberries and strawberries which I loved for a sweet, healthy side. We had the urge to go shopping a bit so we headed to the local mall in Traverse City. I went a little crazy because we kept finding great deals. Adalyn got to pick out a couple of stuffed animals for the first time which was fun. 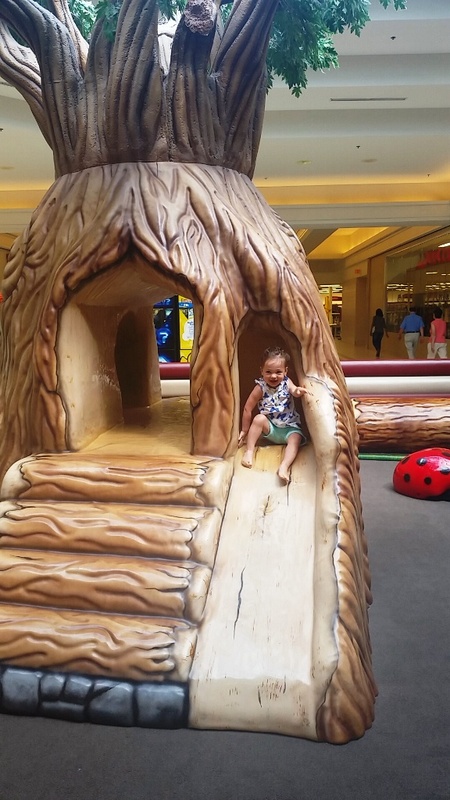 There is a great play center for kids in the mall that Adalyn loved. After Adalyn’s nap we headed to the Cherry Republic in Glen Arbor on our way to Sleeping Bear Dunes. We did a wine tasting of different cherry wines and Adalyn got to taste a few of their pops. We went to the Dune Climb at Sleeping Bear Dunes and it was crazy hard climbing up the dunes. Troy wore Adalyn on his back and we alternated from walking and running up the dunes. It was a beautiful site to see but not for those who are very out of shape because it was quite tough. Then, we went to dinner at The Manor on Glen Lake which was an adorable restaurant with a ton of history. Glen Lake is a gorgeous lake. We said that we would even stay around there next time because everything is breathtaking. We had a delicious dinner with Traverse City local cherry wine. Troy loved his creamy potato soup and I loved my stuffed shells. This restaurant is a hidden gem near the dunes. If you go out to Sleeping Bear Dunes, definitely check it out! Right across the street is Glen Lake where the water is clear and so beautiful! Afterwards, we went to what we think is the #1 must-do thing in the area: a drive at Pierce Stocking Scenic Drive where you can get out at about 10 different spots and have amazing views of the dunes, Lake Michigan and the surrounding forests. Adalyn loved playing in the sand. Absolutely breathtaking and this is something that we will be coming back for, hopefully this fall! The next day, we packed in a bunch of different fun attractions. First, we went to the hotel pool which Adalyn loved so much. She was the most comfortable that she had ever been in a pool and enjoyed jumping off the edges into our arms. During the week was an amazing time to travel to Traverse City because it was so quiet everywhere we went. We found our favorite park which is a couple of miles from one of the main beaches called Greilickville Harbor Park. 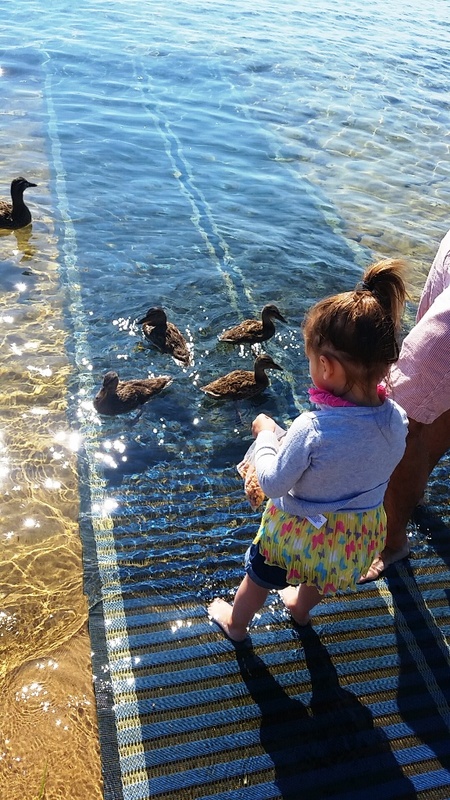 It had a beautiful playground, we got to feed the ducks and walk around the marina. No one was there and I cannot understand why as we found it to be the most beautiful beach in Traverse City. We then went to the Great Lakes Children’s Museum which was very fun for Adalyn. They had a water table to play at and all different kinds of hands-on science displays that were very cute for little kids. If we had more time, I would spend more time there. As a science teacher, Troy loved it. Then, we went to Gallagher’s Farm which had chickens, pigs, bunnies and sheep which Adalyn went crazy over. They will have cherries ready soon! Adalyn stole a couple already- she loves her fruit. We bought some fun horseradish pickles inside of the market. Everywhere we went, we would hear about Moomer’s Ice Cream and how we had to go. It was sold at many different locations but we decided to go to the main location for our first time eating it. You can buy your ice cream and sit outside and watch the cows. We got a 5 ice cream sampler which was a great way to get to try a bunch of the homemade ice cream flavors. My favorite was the rum raisin flavor while Troy liked the Monkey Tail best which was a banana ice cream with nuts in it. Adalyn loved them all. The other flavors we tried were the sea salt caramel, toasted coconut and raspberry cheesecake. That afternoon, we walked downtown and had a slice of pie from the Grand Traverse Pie Company. I had the Strawberry Rhubarb pie and Troy had the ABC pie (apples, blueberries, cherries). That evening, we had dinner at our hotel at Reflect Bistro. We had high hopes since we loved the breakfast so much. The food was good but the service was lacking, possibly because the restaurant was busier in the evening. 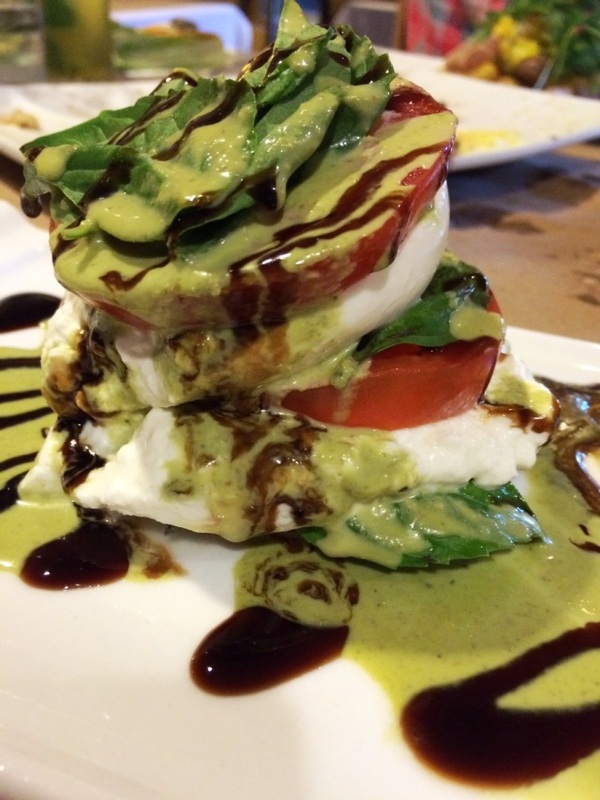 I loved my layered caprese salad- I must recreate this! The Ultimate Nachos were fun with tomatillos, black beans, tempura avocado and fresh pineapple. Troy loved his Surf and Turf. That evening, we packed up and the next morning, went back to our favorite beach to play a little before our 4 hour (ended up being 5 hours) drive home. It was an incredible trip and I can’t wait to return. Until next time Traverse City!